The GO-A2 generates a constant speed of 8-RPM, and a power output of 2,000 ft-lbs. The GO-A2 is an air-powered, hand-portable, compact Railcar Gate Opener with handheld controls for rapid Forward-Reverse action. The GO-A2 Railcar Gate Opener can utilize its capstan drive fitting, or fit over the barrel of a worn capstan and utilize the capstan’s socket notches. Site security requires portable, easy removal and storage of tools and equipment. Withstands the rugged use and operating conditions at unloading sites. Enables one worker to easily carry and position this 45-lb powerhouse. 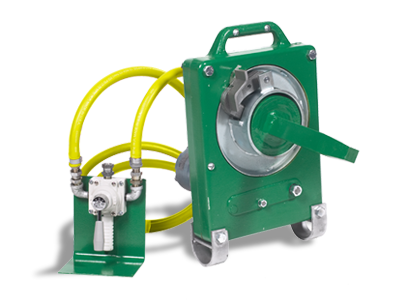 Enables operator to easily and safely open or close gate from up to 6-ft away. 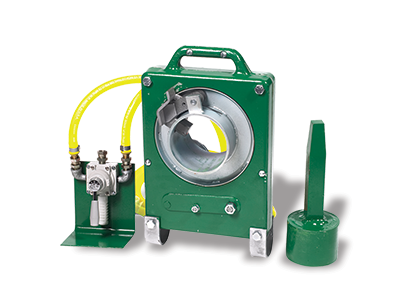 Accommodates railcar capstans without external dog slots. Facilitates steady gate opening without concern for wear of gate mechanism. Operates At Less Than 92 dBA to accommodate for noise restrictions at plant and unloading site operations. Enables greater productivity and reduced man power planning. Reduces rust and corrosion in harsh environments.